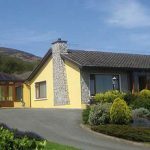 Beachcombers is a very tastefully renovated cottage situated on one of the finest sites in Co Louth, on the shores of The Cooley Peninsula which will give you spectacular views from The Mourne Mountains to Lambay Island on a fine day. The cottage consists of three bedrooms (one ensuite), bathroom, kitchen, living room with sea views from al windows. The open plan design combing kitchen and living room is exceptionally impressive with the large kitchen bay window and stone fireplace. Situated 8 km from Medieval Carlingford and with Templetown Blue Flag Beach 5 minutes walk along the strand this is an ideal location for a tranquil break’.